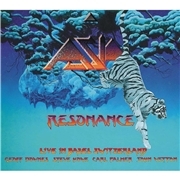 Reunited veterans ASIA, with all original members on board when this album was released, are somewhat productive with live albums. This is the third since their revival, and they seemed to think that “Fantasia” was too polished and “Spirit of the Night” a festival document. This one is said to be the band resonating an in your face “Omega” night in Central Europe. Let´s see if this one does them justice. The track list is quite in favor of “Omega”, with highlights such as the classic ASIA tinged “Holy War” and the keyboard heavy “End of the World”. But I still think that the most tender moment of latter years is “An Extraordinary Life”, with its reality-based theme. There is a solo opportunity for Carl Palmer in “The Heat Goes On”, two instrumental spots for Steve Howe, “All´s a Chord” and “The Valley of Rocks” and a sort of solo fire at will for everyone in “Sole Survivor”. The obligatory major hits are here too, of cause, could you imagine ASIA leaving the stage without doing “Only Time Will Tell” or “Heat of the Moment”? The latter two are the real gems of the show, closely followed by the quite haunting cancer story of John Wetton “An Extraordinary Life”. Will this one outshine the previous two live albums? Maybe, that is up to you dear buyer.